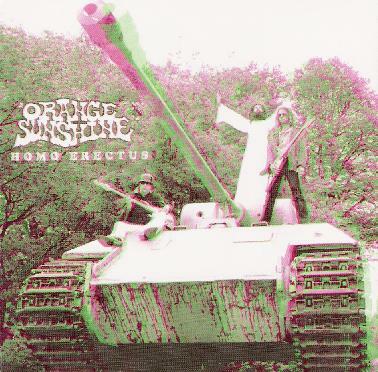 Orange Sunshine - "Homo Erectus"
The excellent Japanese label, Leafhound, have released on CD the first vinyl only record by the Dutch band, Orange Sunshine. If you want to take a trip back to San Jose 1968 and relive the feeling and sound of Blue Cheer, then Orange Sunshine are just for you. The CD (also available on limited edition LP) are with full 3D artwork, which looks very cool if you have the glasses! A great story about how the band is from 1969 is written into the book (of course these guys were not even born yet!). The CD and vinyl issue give you 2 bonus tracks that were not on the now sold out first record. All I can say is if you like Blue Cheer then you deserve to give these guys a spin as it is an authentic sound and they have some really great songs as well.